Its that season again. Election Season. 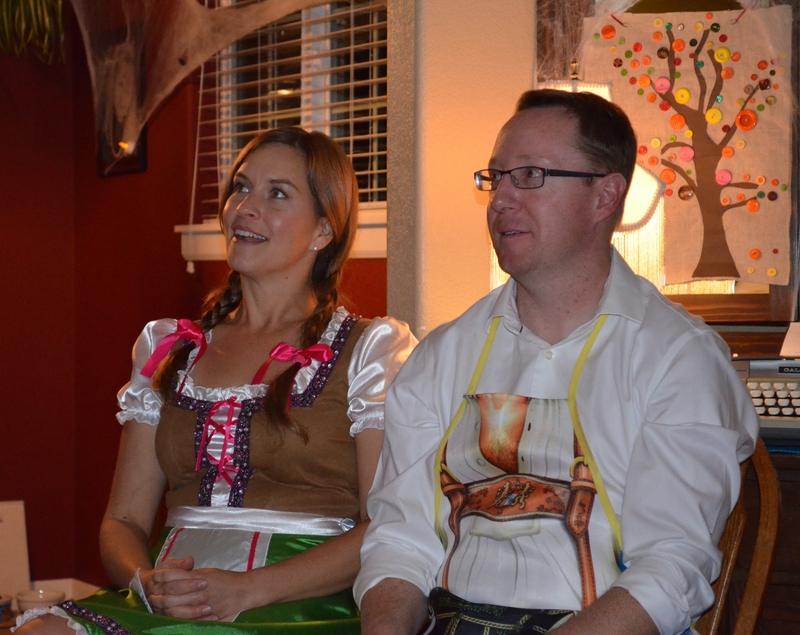 What better way to celebrate than to have a Halloween Party? I decided to use the Big Election as a launching point for my 5th annual invitation, but the party itself was not politically themed because I wanted people to show up. Show up they did! In their costumed best. 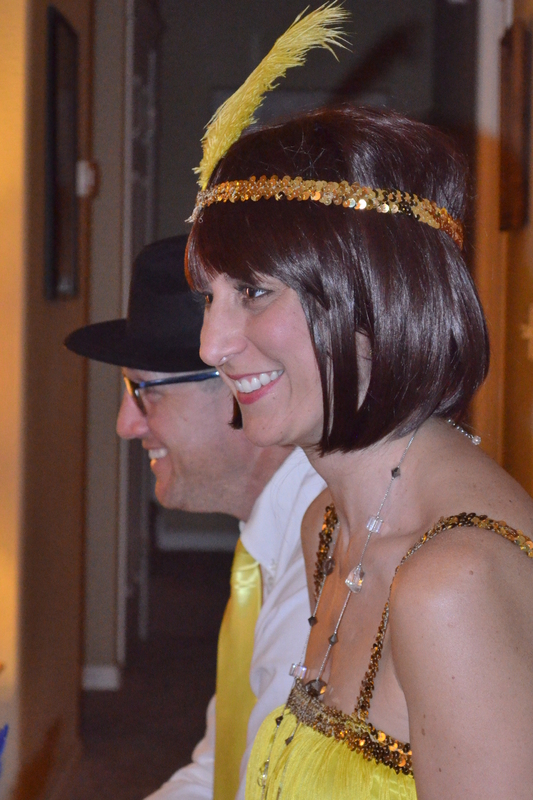 I adore our friends for donning costumes and smiles to our party every year. I know that some of them would rather sip their gin and tonic in the comfort of sweats on their own couch, but they come and socialize and fain interest for the sake of the party. Speaking of gin and tonic, it seems to be my belief that cocktails add to the atmosphere and also to the ease of the guests wearing scratchy materials. I also feel that easy does it and so I employ my bar tendering husband to serve up simple and classic combinations. We also had hard cider and plain sodas for those seeking something mild. The food! (But first a disclosure on the photo featured here: I took this picture before all of the food was displayed and then I decided not to take another picture when it was complete because I was enjoying the party instead.) 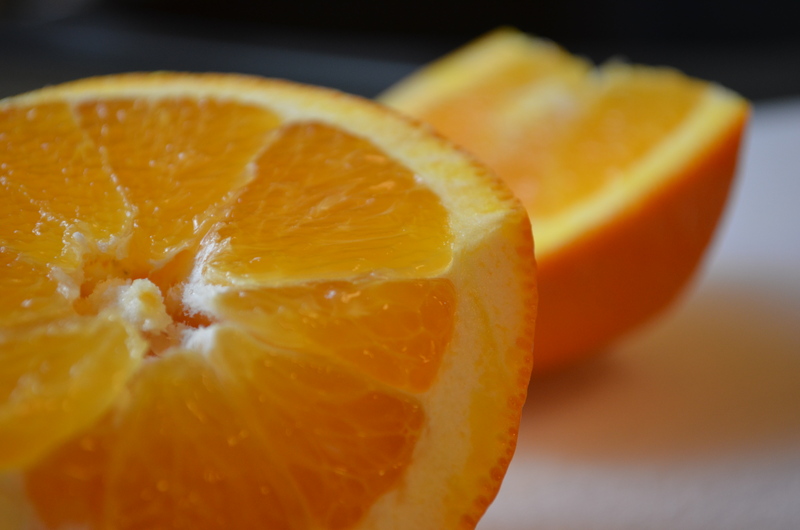 I’ve discovered that Halloween themed hotdog mummies and Jack-O’-Lantern mandarins are just too fussy for my style. I used to spend days making clever Pinterest food but now, nope. Instead I stick with what works and what people will eat. Still using my go-to recipe source, I decided on these turkey and cheese sliders because they can be made ahead of time, candy corn puppy chow , which is always snatched up in a hurry (and I secretly save a bowl of it for our family for the next day), and this last minute caramel apple cream cheese spread, OMG I’m so glad I did! I also put out Hood River made Juanita’s tortilla chips, a big veggie platter, and some olives, pickles and pepperoncinis. The kids. Oh boy! Er, boys! Lots and lots of boys. Somehow, back in the mid 2000s, while my husband and I produced a replacement for each of us in the form of a boy and a girl, all of our friends produced two boys (God love ’em, I know we do!) 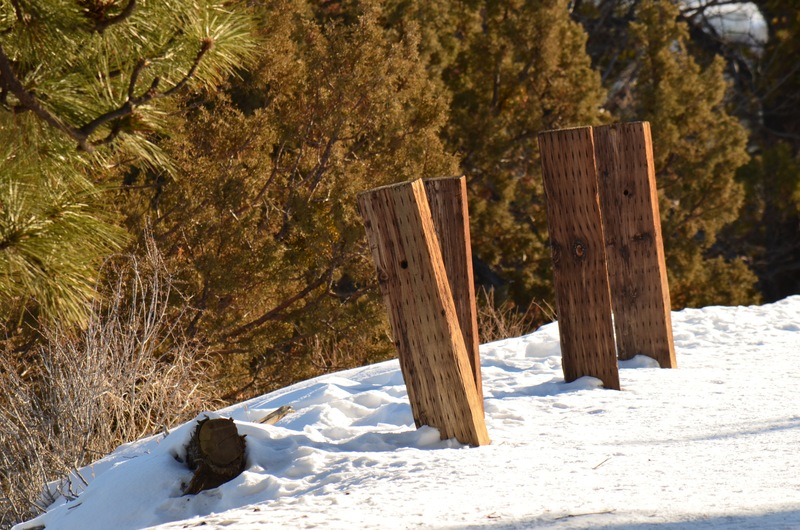 This equates craziness and a high potential for broken limbs. Admittedly, last year the kids got a bit out of hand and the disaster remaining after the party tainted the memory of it somewhat for me. I LOVE hosting but I also insist on harmony in my home and family. So my husband and I agreed that the situation surrounding the kids had to be addressed in advance and we added a blurb about it in the invitation. This caused some raised eyebrows and persuasion of attendance again this year, but it was so worth it! The kids were phenomenal and had a better time this year too because everybody was under control and enjoying themselves peacefully. We let the election season carry on in the form on a vote for the game that we played. It was a landslide for Minute to Win it and so the others conceded their candidacies and offered a peaceful transfer of power. Some may say that this was rigged, but I have the votes to prove it if you want to see them. In the end the party was a resounding success (if I do say so myself) and all patrons left at the end of the night with smiles on their faces. Thus fulfilling my promise that it will be better than anything that happens on Election Day. You are cordially invited to a masquerade ball at the Grand Chateau’ de Howk….The evening will take an unexpected turn from the pomp and circumstance of traditional masquerade when greed and revenge appear from behind their masks. 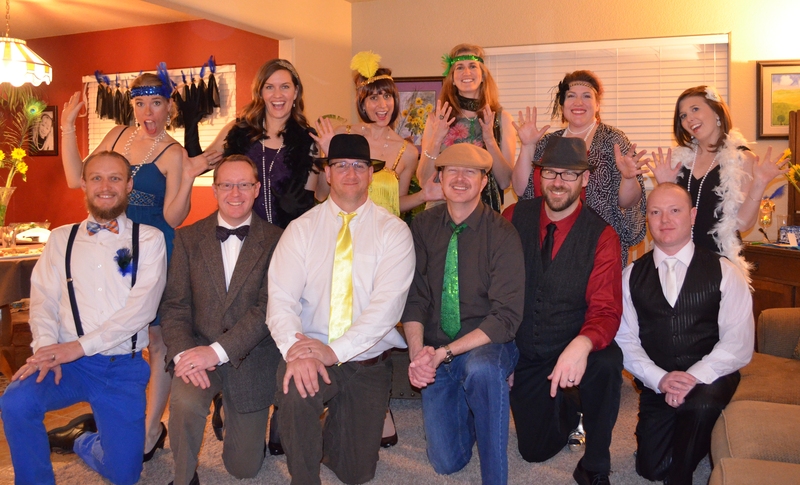 This weekend we hosted our third annual murder mystery party. Guests arrived at our chateau dressed in their wardrobe’s finest formalwear and a mask. We have incredible friends, they go all-out and we LOVE them for it! They had already received character assignments in the mail, so they easily hopped into their alter ego as soon as the time came. We attempted to transform our house into a colonial mansion of societal elite. Pandora played orchestra music. Our house was lit only by strings of white Christmas lights. We arranged the furniture to accommodate a majestic dining room table to seat 14 guests, complete with white linens and bouquets of roses. The seats were assigned and marked with a wax sealed and labeled scroll. 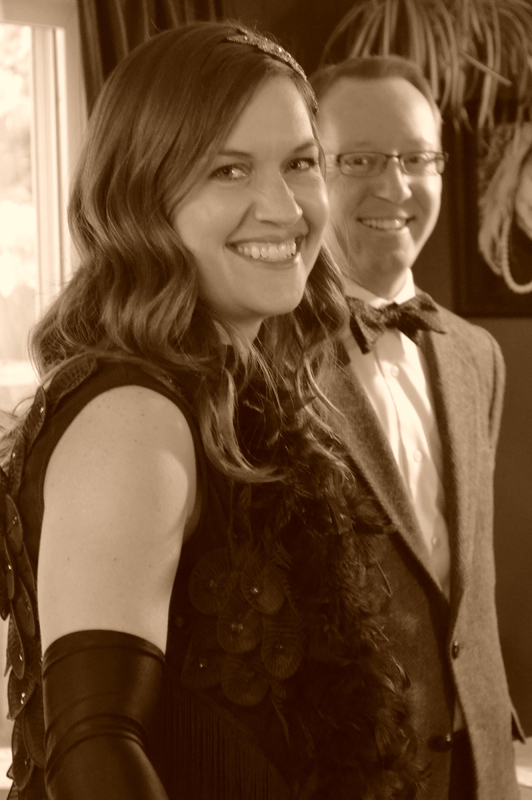 The Lord and Lady (my hubs and I) made welcoming announcements and introduced each couple. Guests were then given some time to drink their first round of cocktails and find out a little bit about the other characters at the ball. This is when everybody starts to loosen up and get into their roles. Nervous laughter transitions into a good time. Dinner is served. Grilled elk steak, chicken and fish, roasted red potatoes, green salad and dinner rolls. As the Lady read the menu, Lord Howk rushed in to announce that a murder had taken place and that nobody was allowed to leave until the criminal had been apprehended. 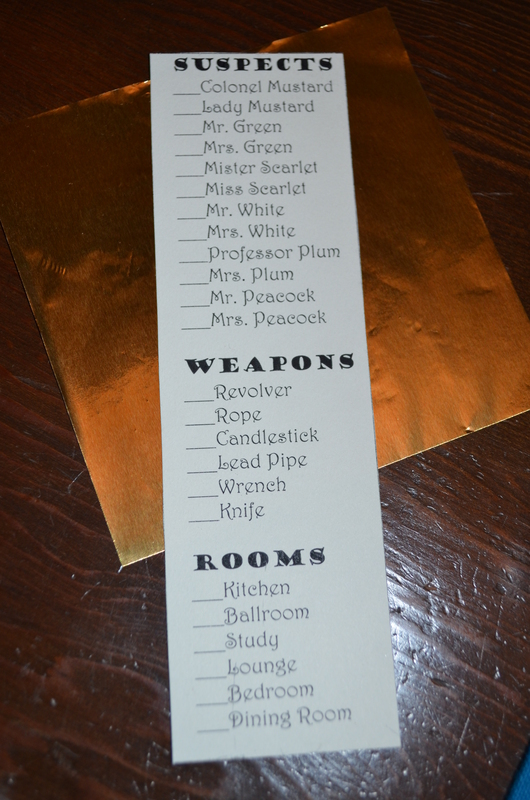 Each guest then opened a sealed scroll with further instructions specific to their character. As we shared a meal, guests used their newly discovered information to have conversations that developed characters and made a few eyebrows raise in question of motives. As tensions mounted and everyone aimed at solving the crime, guests moved between our downstairs living areas and our upstairs grand ballroom. This allows space for private conversations and deals to be made. 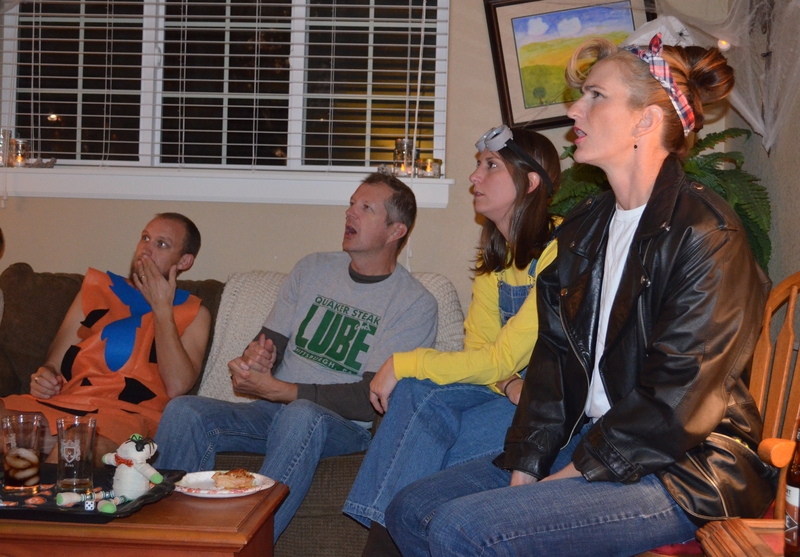 Guests reconvened for dessert and more speculation. It was a tremendous pleasure to see the plot develop as I had imagined when I wrote it. At one point I looked around at all of our masked friends laughing and carrying on and thought about what a gift they all are and what a true delight it is to throw a party for all of these people who I adore. It went according to plan, there were suspicions headed in the right directions, but neither the murderer or motive were easily apparent. The Lord and Lady gave twenty more minutes to tie up loose ends, and with that everyone was off to gather as much information as they could before the final resolution was read. Everyone was seated for one last time and each guest was given the opportunity to say who they thought the murderer was, what motive the murderer had, and their method of finishing off the Old Man. It was fun to hear each speculation as many of them got parts of the solution correct, but only the highly educated Mrs. Rolonda Whitaker was able to correctly put all of the pieces together. The party was a grand success and it seemed like everyone had a nice time. I sincerely appreciate our friends for finding childcare, getting all dressed up and coming to enjoy the evening with us. Now that I know how to write the plot, I plan on doing so again next year. In fact, the time period, theme and characters are already introducing themselves to me and I’m excited to write them when the time comes. 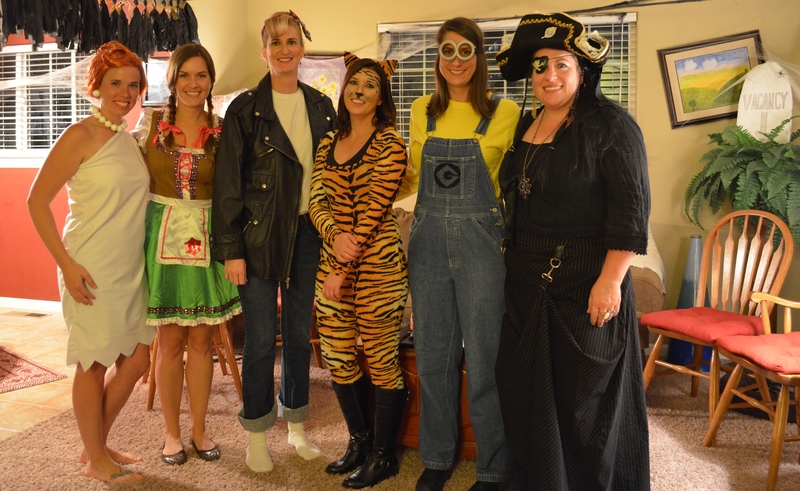 We had our fourth annual Halloween Party last weekend. My parents had a big bash every year and so I’ve carried on that tradition with my own family. It is a fun party and we are honored to have such great friends to come over and party with us. To begin with, we make our costumes. This is usually a family decision since we like to coordinate. 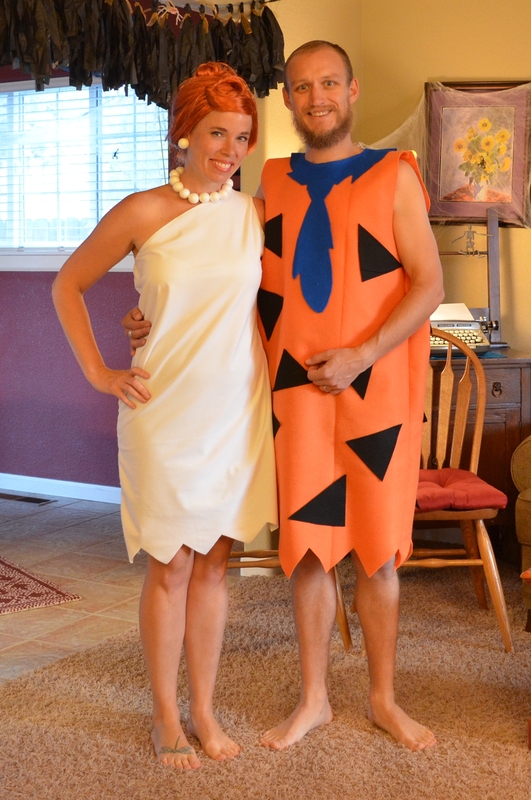 This year we were the Flintstones, Fred & Wilma along with Pepples and Bamm Bamm. 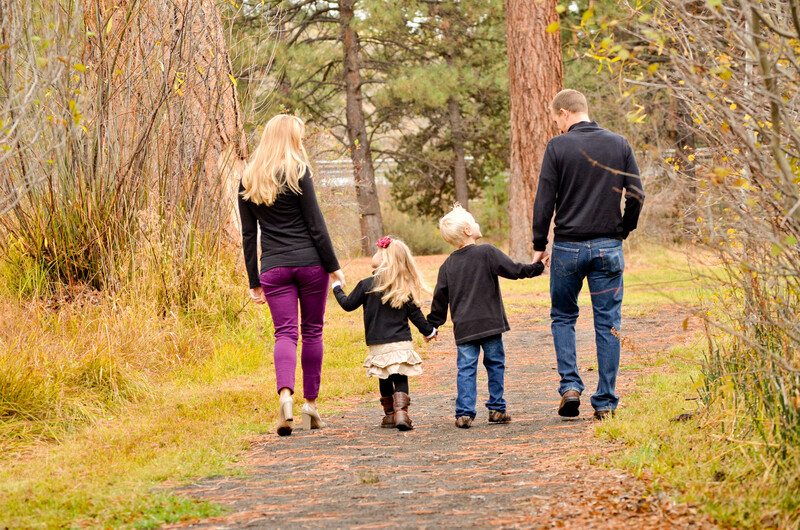 (I don’t put my kids on the blog, but let me just tell you that they were pretty adorable!) My husband and I are a great team in costume making. I come up with the concept, he figures out how much material we need and how to construct them, and then I sew them all. The invitations go out at least two weeks in advance, but three is even better since time is needed for our friends to come up with costumes for themselves. Our friends sometimes come dress to the nines, and sometimes come in simple busy-lives costumes, but we don’t care what they come dressed in, we are just happy to have them come play with us. The party is at dinnertime, but through the years I’ve found that serving large quantities and varieties of appetizers and sweets is much simpler than a complete meal. This year I served some turkey and cheese sliders, apple nachos, chips and salsa, a veggie tray, and some yummy and naughty sweet puppy chow. 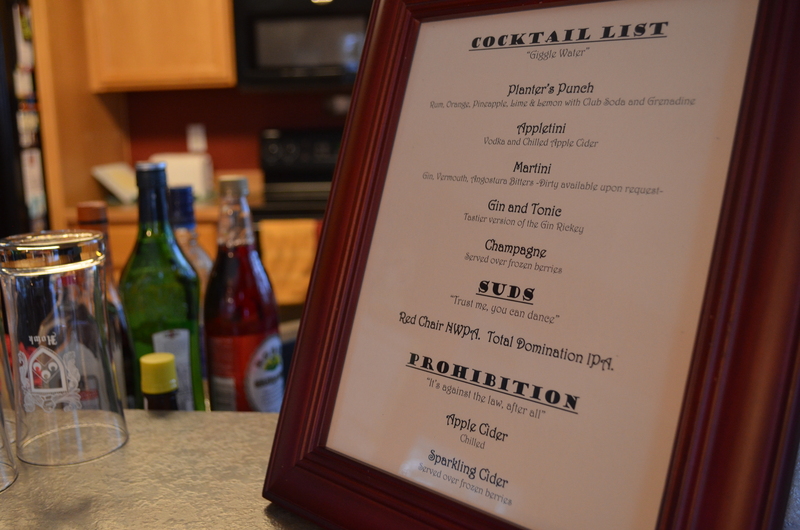 And of course we have our classic cocktails, beer, as well as non-alcoholic beverages. Part of a great party is the ambiance. I am not a professional party planner and there are many hostesses who are far more accomplished at party planning than me, but I can assure you that a good ambiance sets the mood perfectly for the right vibes at a party. 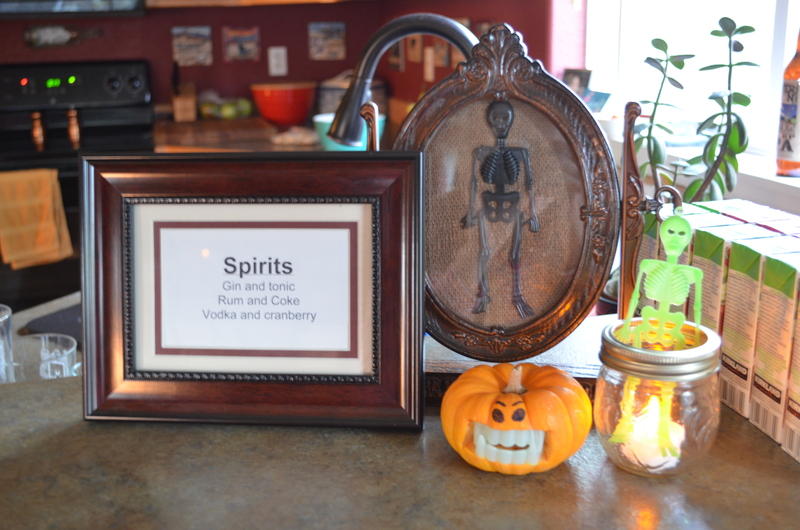 Because of this, when our guests arrive we have our Halloween playlist playing. It includes funny Monster Mash type music juxtaposed with more Psycho Killer tunes. 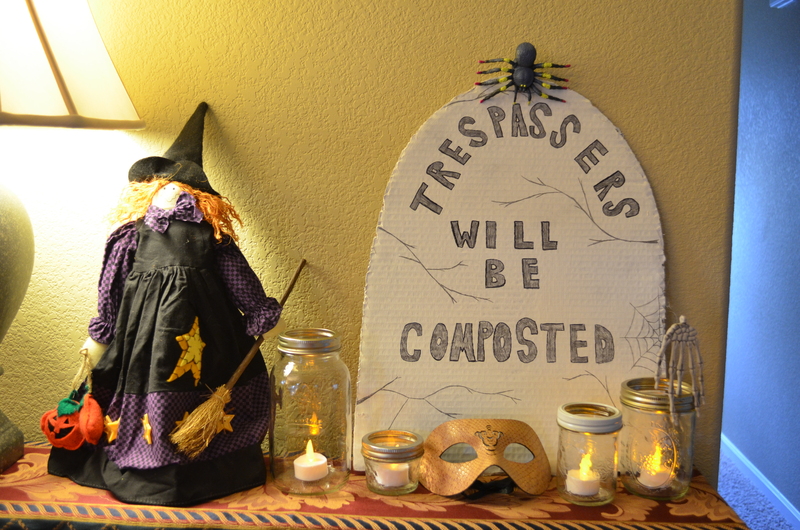 We also spend some time decorating the parts of the house that will be used during the party. After four years I’ve got this pretty much dialed into a nice compromise between minimalistic and over the top. I’m not interested in throwing my entire life into party planning, but I also aim to please and so a good bit of decorating is worthwhile. This is easy with cheap Halloween skeletons and spider webbing. Then comes entertainment. We come up with games for the adults, since the kids at this age range are pretty much happy to have their own time playing Nerf football in the bonus room. In years past we’ve played Minute to Win It games, which were always fun and fully entertaining, but this year we changed it up. Parties need to be changed up from time to time to keep them fresh, for both the hosts and guests. This year we decided on charades, which involved us making all of our own categories and lists. We played two rounds, with some drink refills and family photographs in between rounds. It was great fun. Everyone was a great sport and many laughs were had. 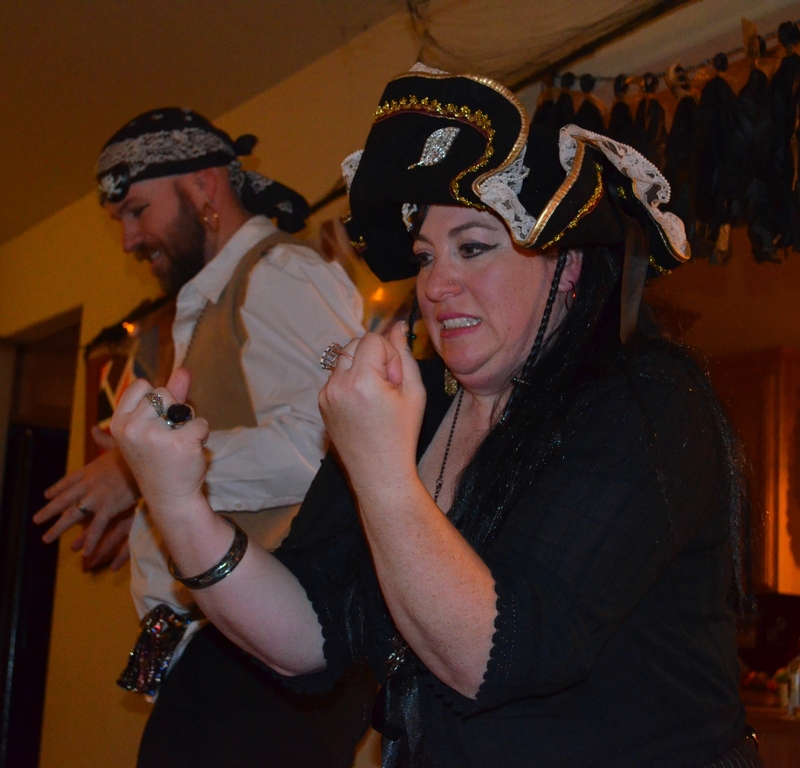 After the adults had their time with charades, the kids took it upon themselves to entertain the adults with their own round of spontaneous charades. 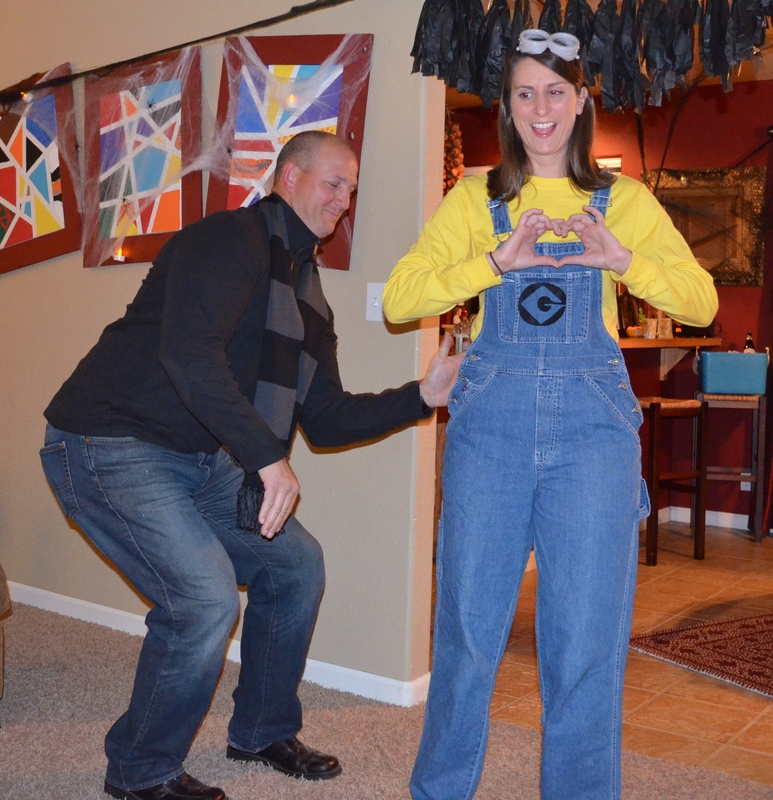 They came up with some pretty good material, especially once Gru from Despicable Me helped them. 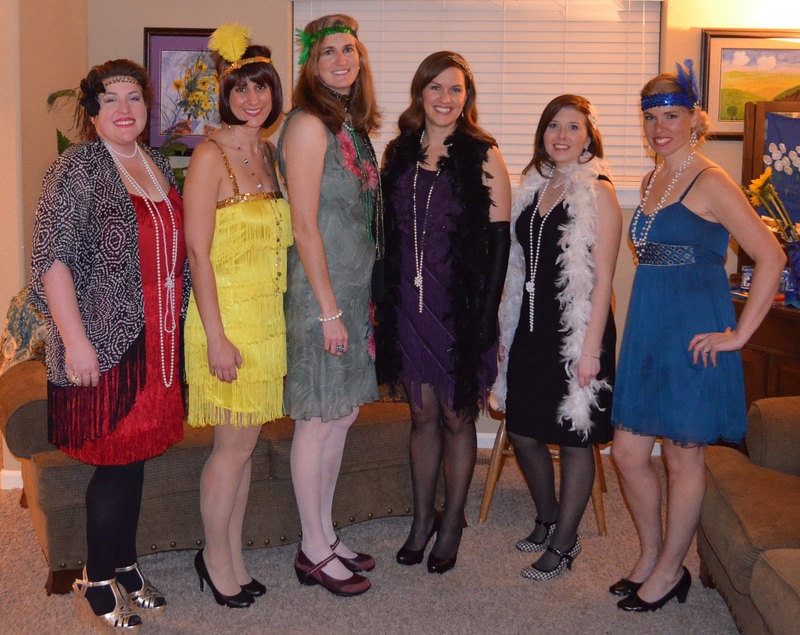 For a fourth annual party, it was a good time to switch some things up. But the best parts remained; good friends coming together for a good time. 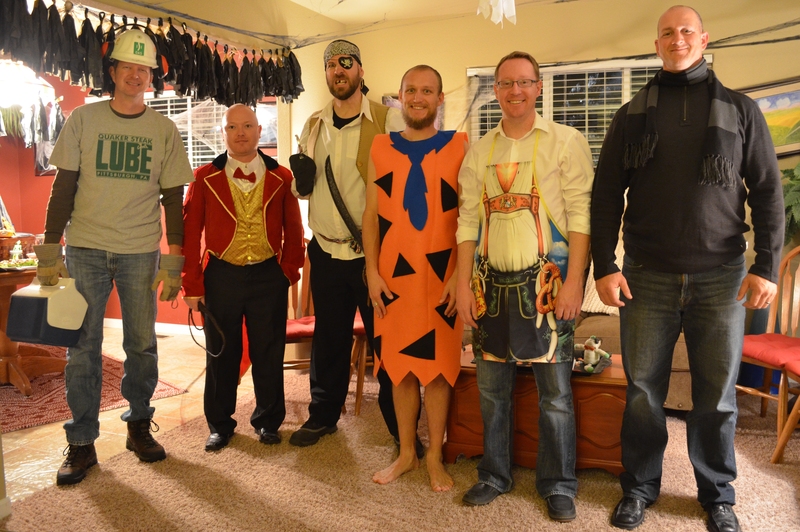 If you’ve ever thought about doing a costume party of your own, you should. It would be fun for you and all of your guests. Its a good way to take a fun holiday and use it as an excuse to have a party. Happy Halloween! 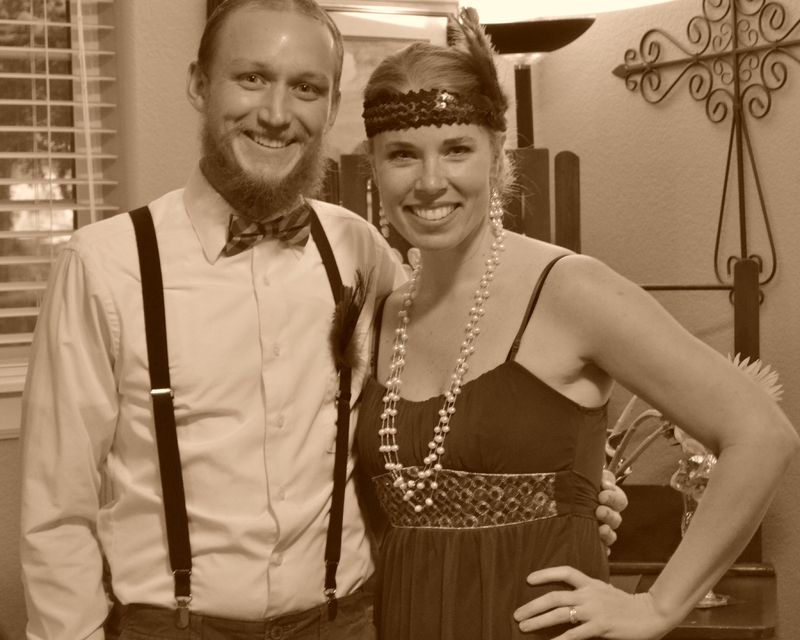 Last weekend we transported ourselves to 1926, the era of speakeasies and bootlegging, the time of pearls and the Charleston. We sent our friends hand-typed invitations about six weeks in advance (thank you to my husband for gifting me a long-desired typewriter) and then character assignments were mailed after RS VPs were received. 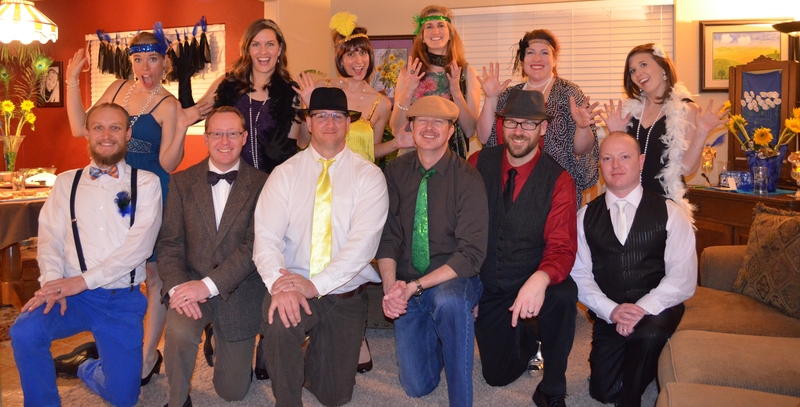 We created this year’s murder mystery to be a life-size version of the board game Clue. For the menu I nabbed a few ideas of foods that would be somewhat authentic from that time period. I did the same thing with the drinks list. Of course none of this is exactly spot-on but it did strike a nice balance between legit and time saving. 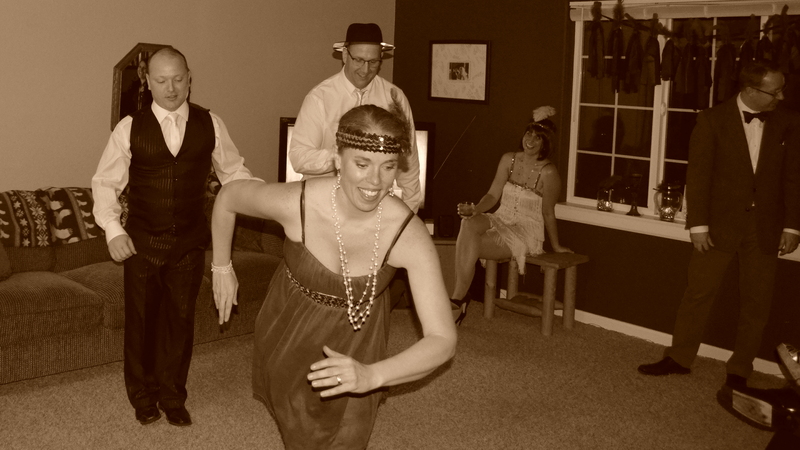 I created a 20s era playlist on the ipod to accompany the evening, which set the mood perfectly. 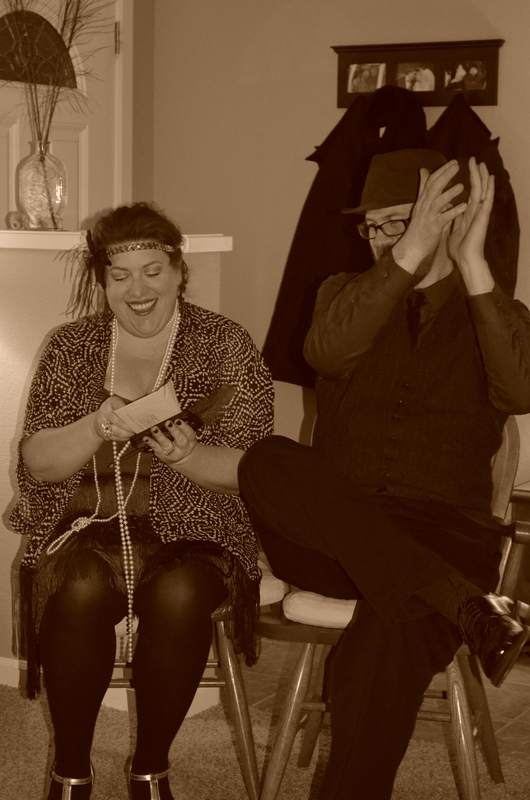 After introductions (or more appropriately –admiration of costuming), appetizers of Medjool dates, deviled eggs, artichoke dip and bar service we gave our guests a run down of the murder mystery. Much like the board game, a single card for each a suspect, a room, and a weapon were pulled from a pile and put into a sealed envelope. Each guest was then dealt two cards which they could immediately mark off their game cards. They were then given fifteen minutes to scour the house for clues. 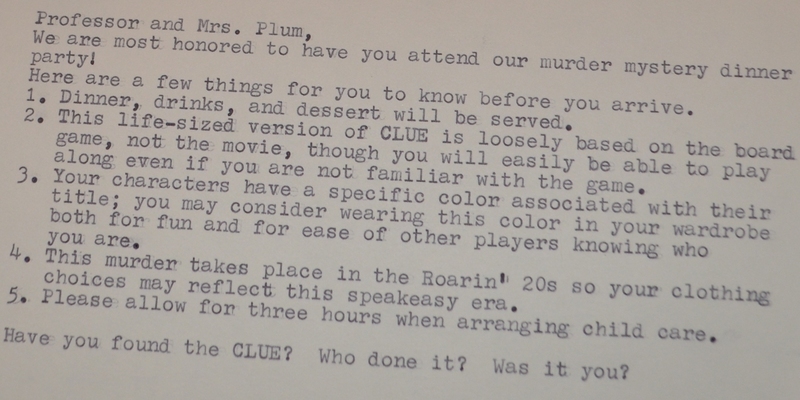 Similar to Clue, our house had six rooms that were used as a part of the game, each with hidden clues either in the form of paper cards, framed words or weapon props, which, once discovered, were left in place for other players to find. We had a mid-round speculation in which our guests gave a single speculation about who, where, and with what the murder was committed. Several people used this opportunity to lend faulty information to throw off the other players, but a few of them seemed to make an actual speculation based off of what they had figured out. At that point we grabbed a dinner including Waldorf Salad and Bootlegger Pizza and cocktail refills and headed to the ballroom (um, bonus room above the garage) where players were given the chance to win a clue that couldn’t be found anywhere else in the house. This meant playing one-on-one blackjack with Mr. Peacock and then, for those who didn’t win at blackjack, took a brief Charleston dance lesson from Mrs. Peacock in preparation for a 50 second recital. 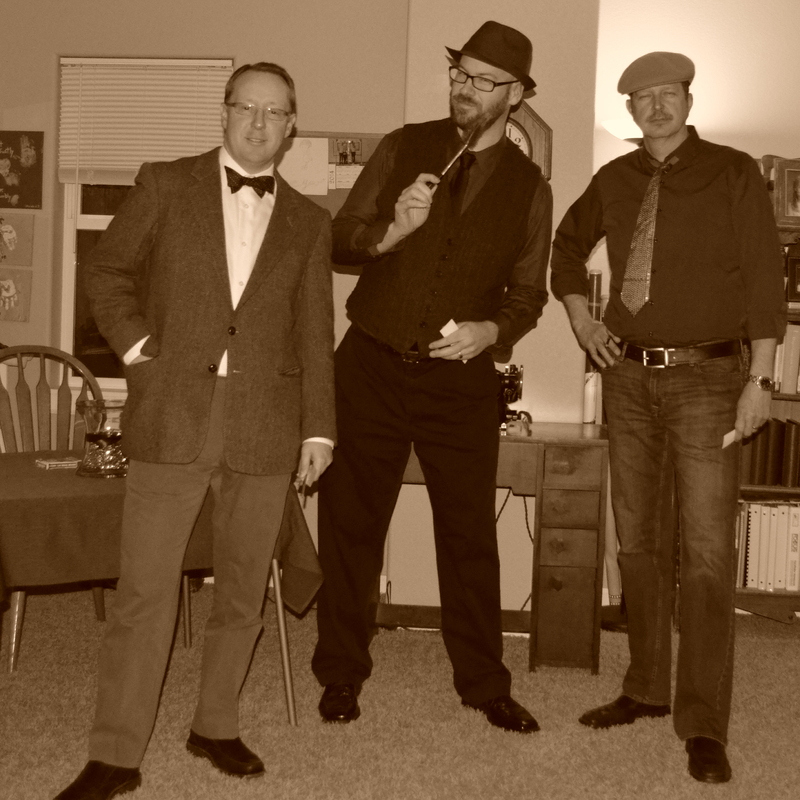 Although only Mr. White and Colonel Mustard lost in blackjack, the entire guest list ended up joining in on the dance and for a quick minute we had ourselves a full-on 20s style dance party. (Aside from Mr. Green, who, I think, videoed it with his phone [not era appropriate] and at some point I hope to see the ev idence of this spontaneous awesomeness.) 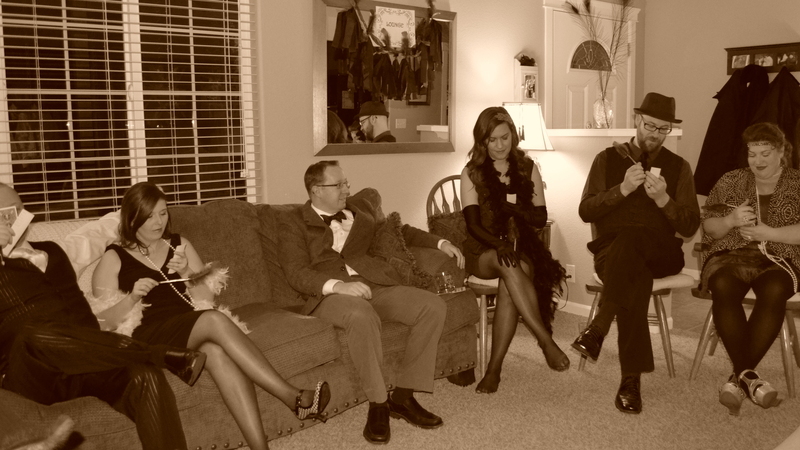 Guests were given an extra ten minutes to search the house for clues that they hadn’t yet discovered. We then convened in the Lounge for the final accusations. 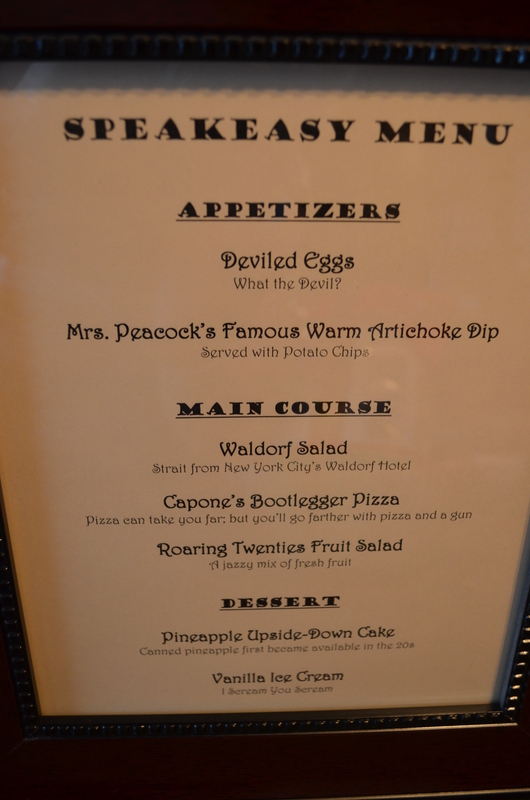 As guests dined on pineapple upside-down cake, neither Mister Scarlet or Mrs. Plum were able to correctly accuse all three points of murder before the murderer herself, Miss Scarlet uncovered the truth. Even she was unsure of her guilt until she opened the sealed envelop to find that she was in fact the murderer. Thank you to each of our lovely guests. We majorly appreciate you putting such effort into finding child care, making and purchasing costume pieces and for being such fun in your participation. I already have ideas for next year’s murder mystery. We would be honored to see you there!